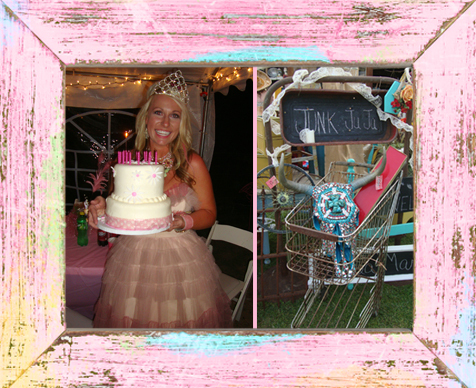 Friday we hopped in the car & headed to Anna, Texas, for the Pinkalicious Prom & Vintage Show produced by Ashley of Texas Trash Jewelry! We thoroughly enjoyed the drive through Northeast Texas & scouted out several thrift stores we visited on our way home Saturday. Joe and I had a blast dressing up for the prom!!! I didn't want to waste time waiting to see if I would be crowned Prom Queen, so I wore my own tiara. I also wore a thrifted denim vest that I had embroidered by Embroidery by Andrea. 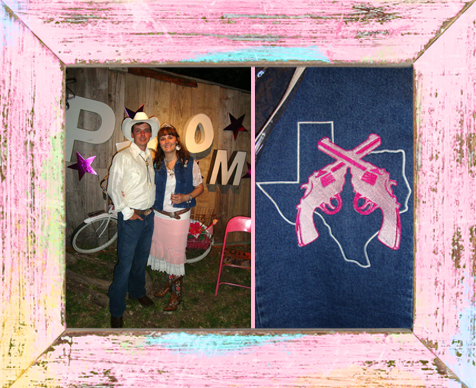 She embroidered a Texas & two pink pistols that I created on the back. I paired that with two vintage slips I layered, as well as my Cowgirl boots & I was ready to go. Joe scored a great vintage Western shirt at a nearby thrift store & paired it with his Cowboy hat & boots along with one of his Dad's bolo ties & belt buckle. Prior to the prom, we had the opportunity to do some Early Bird shopping. There were tons of great handmade & vintage vendors on-hand, including Texas Trash Jewelry, of course, Blossom Shop, Dee Dee Style, and more. 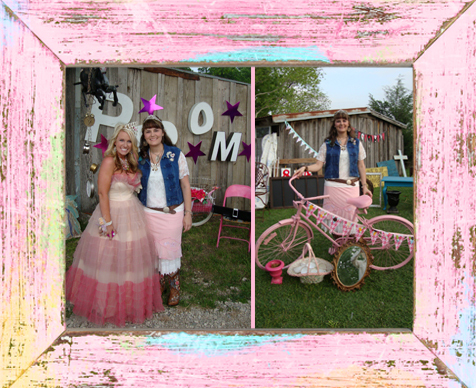 It was a lot of fun seeing all the vendors dressed in their prom attire & they all had great set-ups. Ashley & Jessica (Me) • Me with a lovely pink bike! The weather was perfect allowing us to enjoy a fun-filled evening under the Texas stars. We enjoyed some Barn Red wine by Grayson Hills Winery & some great country tunes by the band. It was a wonderful opportunity to visit with some veteran Funky Finds vendors & meet some new folks. Also, the prom raised over $900 for the Anna Food Bank, too! Many thanks to Ashley for organizing such a wonderful event! I really like everything that you have done here. I am happy that I found your blog.